All of our hunting packages are all-inclusive. The only thing you need to bring is your weapon of choice and your clothing requirements. Once your hunt is booked a detailed list will be sent with the items we feel would be important for you to bring along. Hunters that are guests at our camp stay in our new fully modern waterfront cabins which are equipped with televisions, VCRs, wood-burning stoves, and all the amenities of home. This is no tent camp experience. The comfort level is first class. Meals are prepared and served in our main lodge and dining area and as our past customers will attest, our home cooking is second to none. After dinner hours when our guests are relaxing we provide complimentary movies. This is a rugged Manitoba wilderness hunt with all the comforts of home. Trail End Camp offers exceptional opportunities for Black Bears. Whether you prefer a Spring or Fall hunt, our 100% past record comes from preparation done well in advance of your arrival to our camp. Each pair of hunters will be provided with their own personal experienced guide. We offer tree stands or ground blinds. You will hunt the remote locations along the scenic shoreline of the Winnipeg River. Hunters have their choice of using a bow, muzzleloader or rifle. Six days of hunting, 7 nights accommodation, along with a fully guided world class fishing for Northern Pike, Walleye and Small-Mouth Bass. This will make your hunting vacation at Trail End Camp and Outfitters a memorable one. Notice: Our Whitetail hunts are temporarily suspended. At this time we cannot ethically run whitetail deer hunts as the population is at a level that is 90% lower than traditional numbers. We will let our past guests know when the population is once again at a huntable level and we can ethically run the same type of hunts we have in the past with the same great success rates. Thank you to all of our past Whitetail guests! Trail End Camp’s Whitetail Deer hunting takes place in the Canadian Shield Wilderness surrounding our camp. Your hunt uniquely takes place by boat to access remote hunting areas. Hunting is done from tree stands with the use of shrouds and propane heaters. The majority of deer taken are called in using rattling antlers and grunt tubes. Hunters have their choice of hunting with bow, muzzleloader or rifle. Choice dates for bow hunters start in mid-October and run till the end of rifle season at the end of November. Muzzleloading hunters have their choice of dates starting approximately the third week of October until the middle of November. Rifle season starts in mid-November and carries on till the end of that month. 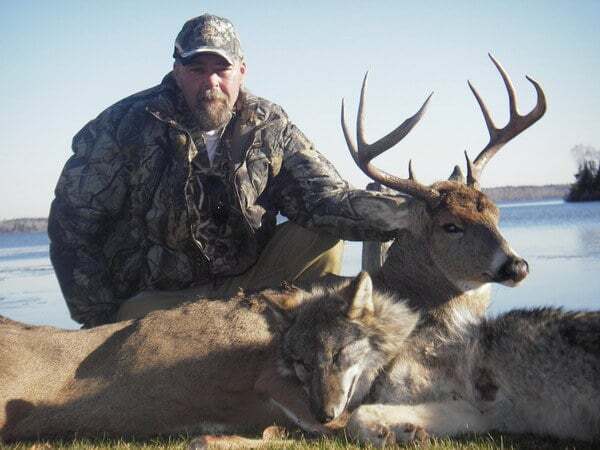 All whitetail hunting packages are six days of hunting and seven nights accommodation. Specific fall dates vary year to year. Whitetail Deer hunts are 6 full days of hunting with 7 night’s accommodation. 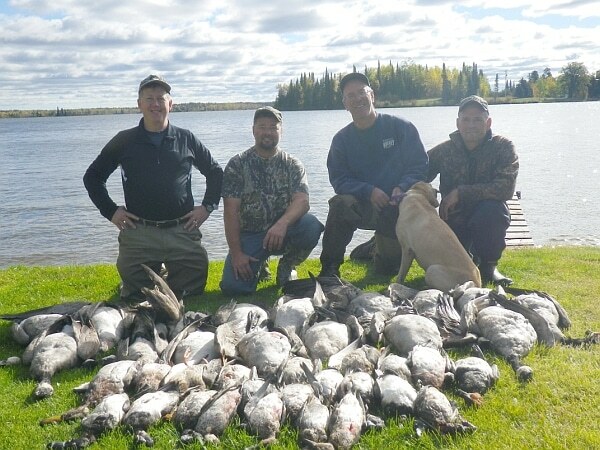 Waterfowl hunting has been a long-standing tradition at Trail End Camp. A tradition that continues today over the large natural wild rice lakes that are common to our area. From approximately the last week in September until the middle of October, the fall migration is at its peak. Our hunters view the expanse of the lakes from dry, comfortable blinds (we supply all the decoys). A compliment to the many species of ducks are the Greater Canadian geese that annually frequent the area. A set of floating Canadian decoys is standard next to our duck sets. This helps to pull the largest geese in North America into range. The three-day package includes 3 full days of hunting, 4 nights accommodation, meals and fishing. Licenses and Applicable taxes are extra costs unless stated. Airport pickup can be arranged. All hunts require a 50% non-refundable deposit. Balance of package price due upon arrival. 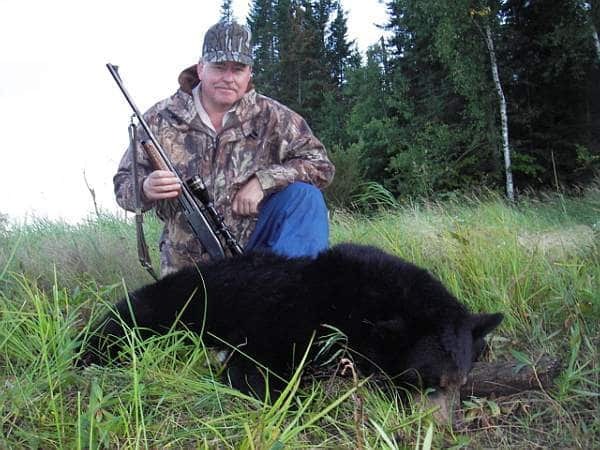 All Hunting Packages are quoted in U.S. funds (USD) unless otherwise stated. All cabins are equipped for our customers to take care of themselves if they so desire. These rental rates are guidelines. *** 50% deposit required on all bookings. DEPOSITS ARE NON-REFUNDABLE. Prices do not include applicable taxes.